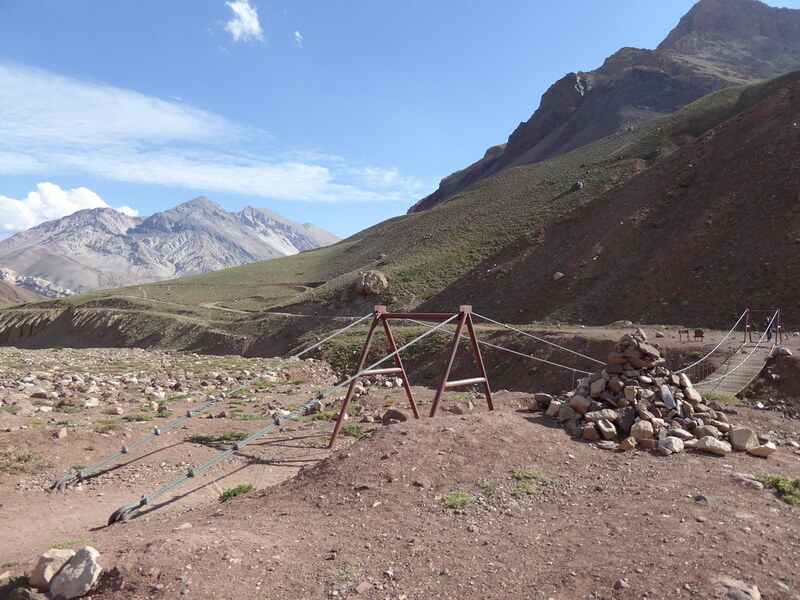 I am writing this some time after our foray up Aconcagua. I learnt a lot from this part of the trip. 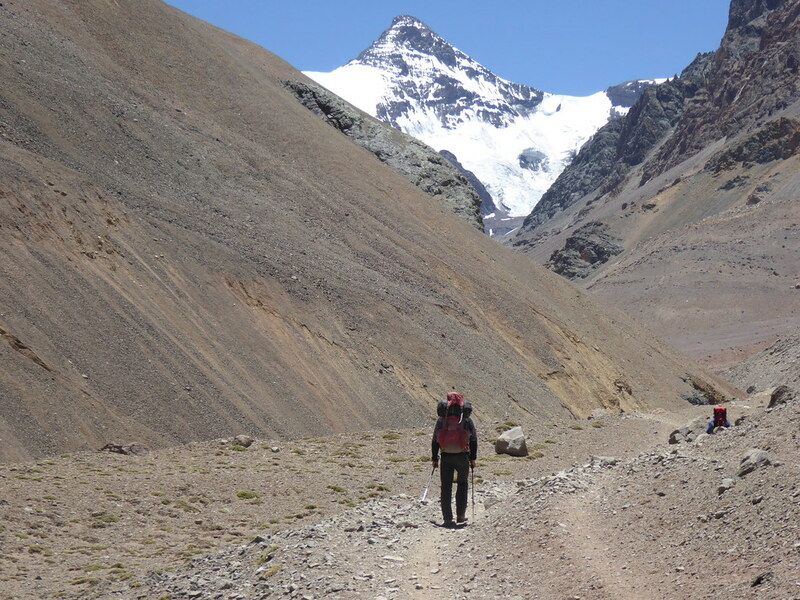 The ascent was not successful in terms of reaching the summit, but the learning about how to manage expeditions up big mountains was significant. 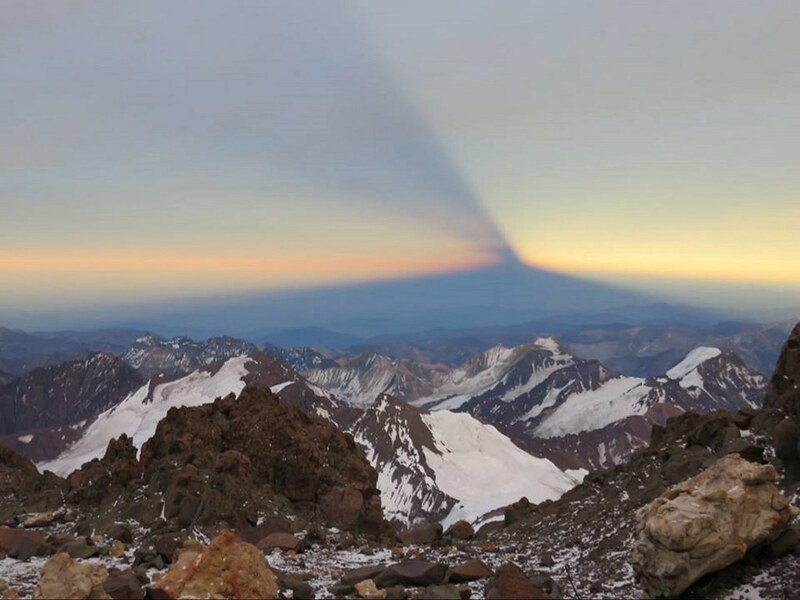 I doubt I will ever return to Aconcagua, but being the highest mountain outside of Asia, what I learnt will be useful if I attempt anything nearly that high again – particularly on any mountain located in an arid environment. 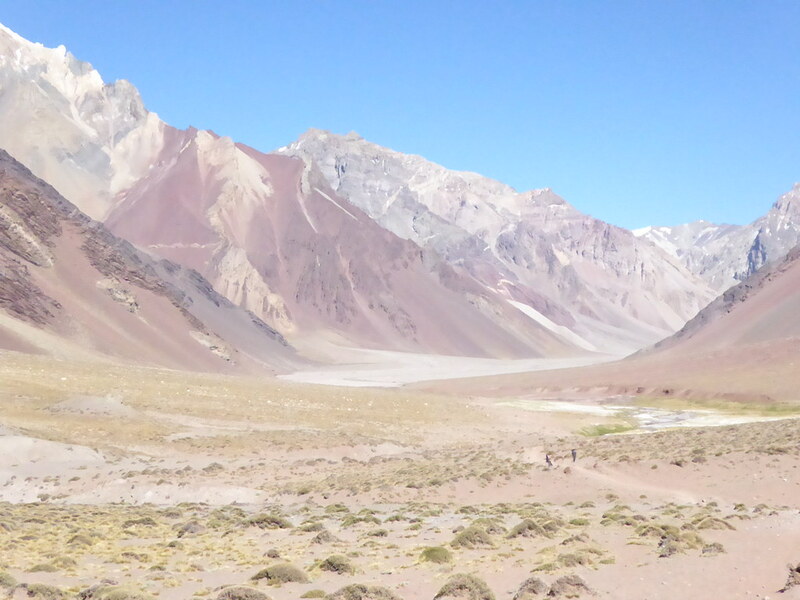 In retrospect, I did not realise how much my cough had debilitated me, even with the rest that the journey south from Ojos del Salado and the three nights in Mendoza had provided. I was probably also not in the right frame of mind. My cough returned and my strength did not. What are my impressions? 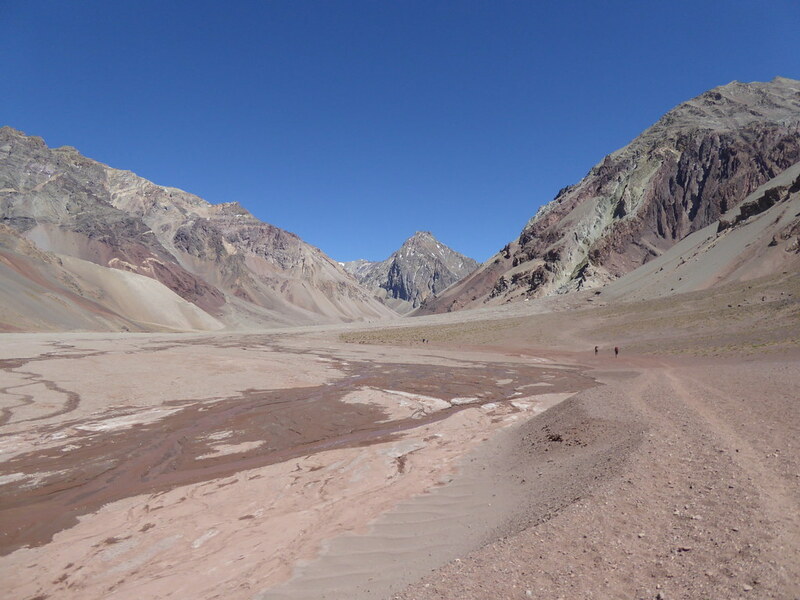 Aridity, dust, harshness, dust, the wind, dust, the cold, dust, stunning glaciers and greater numbers of people (and this was not even high season) and dust. 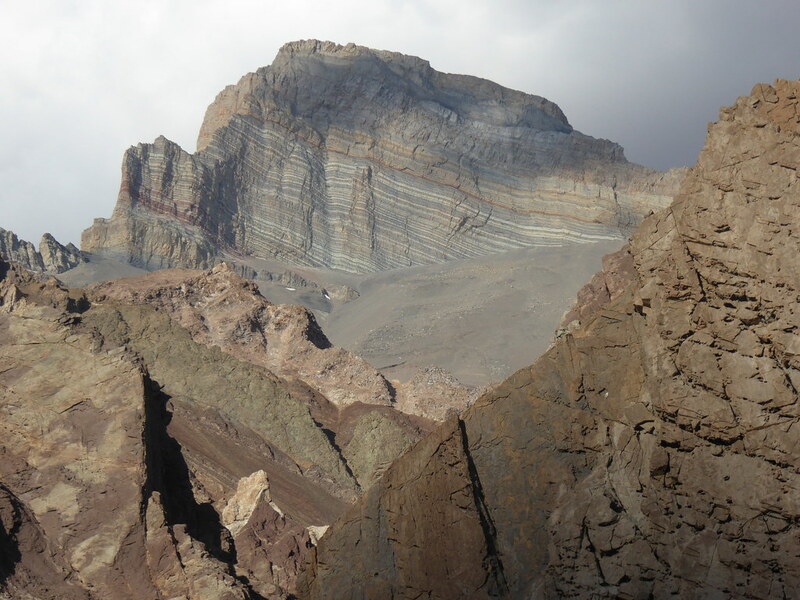 This is the highest mountain outside of Asia, yet is “only” 69m higher than Ojos del Salado. 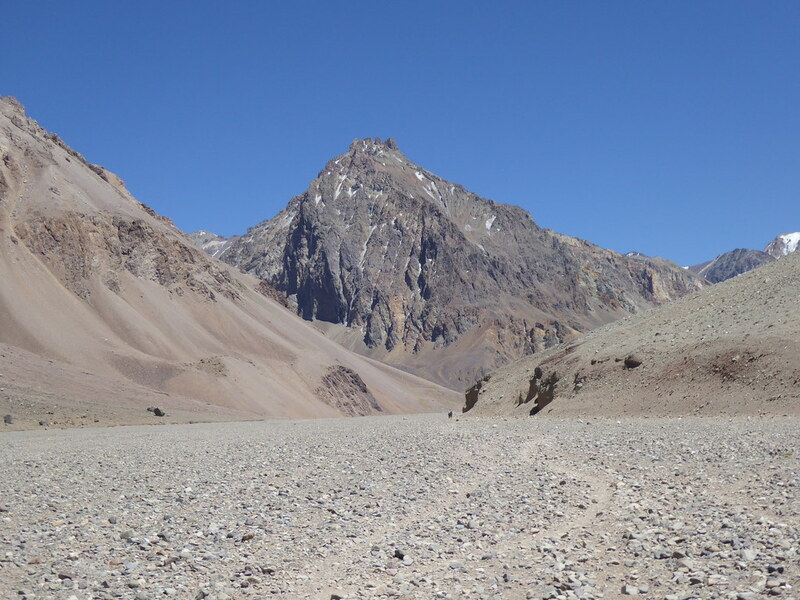 Whereas one can reach the base camp for Ojos del Salado by 4WD vehicle, reaching base camp on Aconcagua takes the best part of two days on foot. 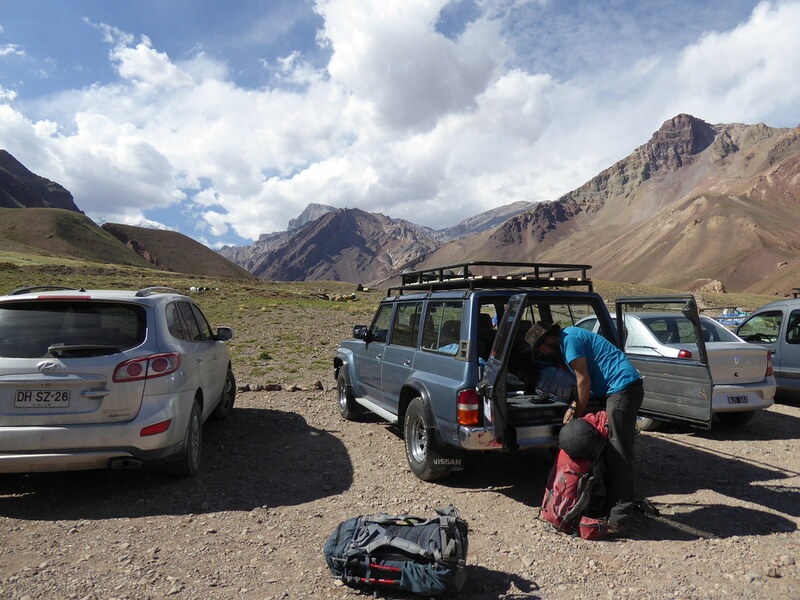 We left Mendoza on 8th December. We were late in doing so, compounded by our guides not knowing the way out of the city to the highway that led to our destination. Still the drive through vineyards was attractive. Eventually we found the right route. 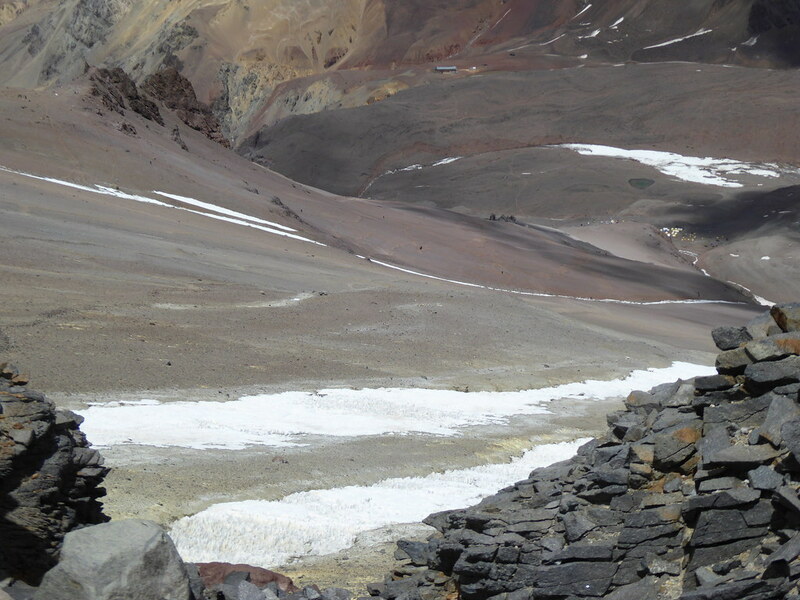 3½ hours later we reached Penitentes, high up in the Andean chain which (in winter) is thronged with skiers. In summer, the hotels make a sorry sight. This is where we would dump the kit we did not need for the next week. 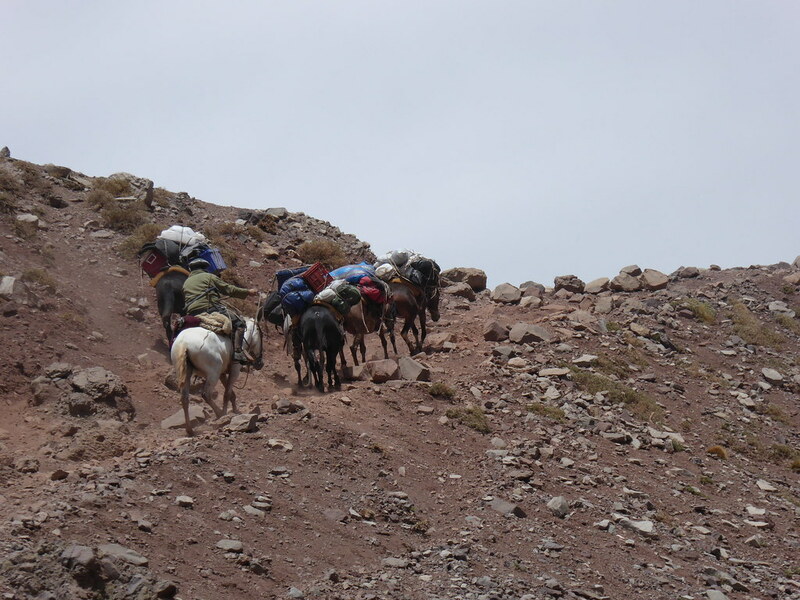 What we did need was left to be picked up for the mules who would carry it to base camp at Plaza de Mulas. So we would see this in two days’ time. 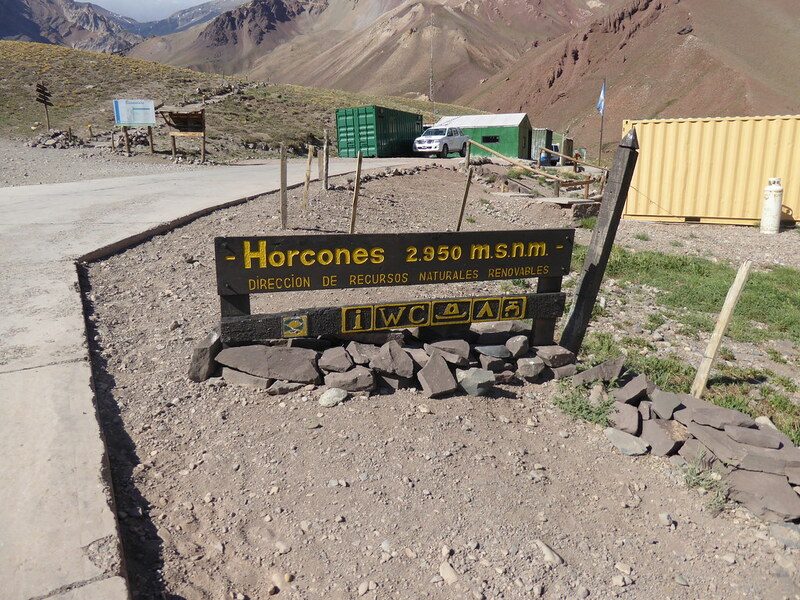 Then it was off to the Park entrance at Horcones to have our permits checked and stamped. It was not until 4pm that we were able to set off. This was about 3 hours later than originally planned. It did not put Derek or myself in the best of moods. 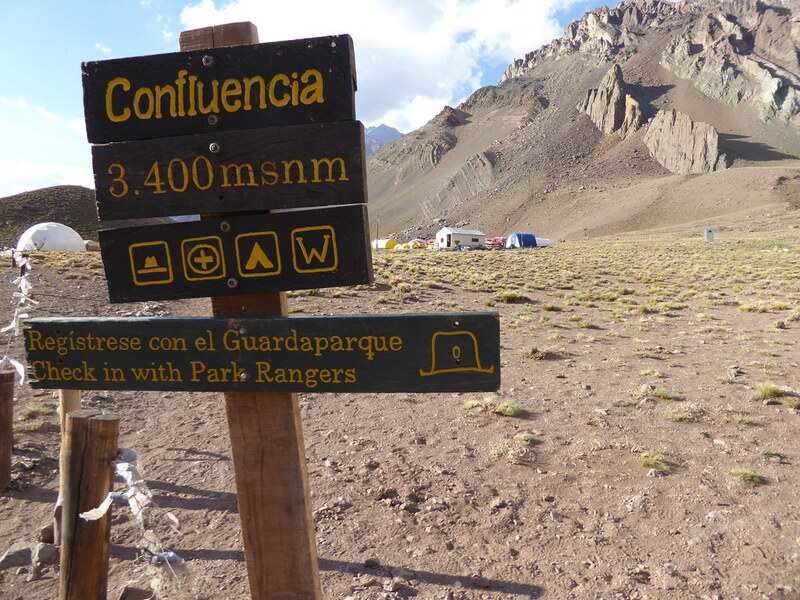 There are signs at the Park entrance telling you how far it is in hours to various camps. Our first camp would be Confluencia which was stated to be 3 hours away. Plaza de Mulas is stated to be a further 8 hours. 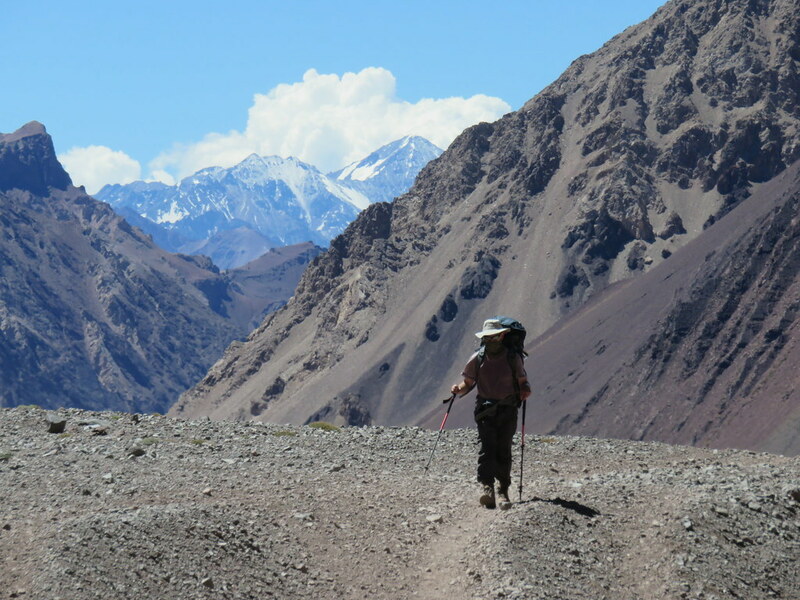 Our packs were relatively light but we were having to carry some overnight gear plus lunch for the following day. I guess our ire got the better of us and we blasted our way to Confluencia in 1¾ hours. We even arrived before the sun went down behind the surrounding mountains. 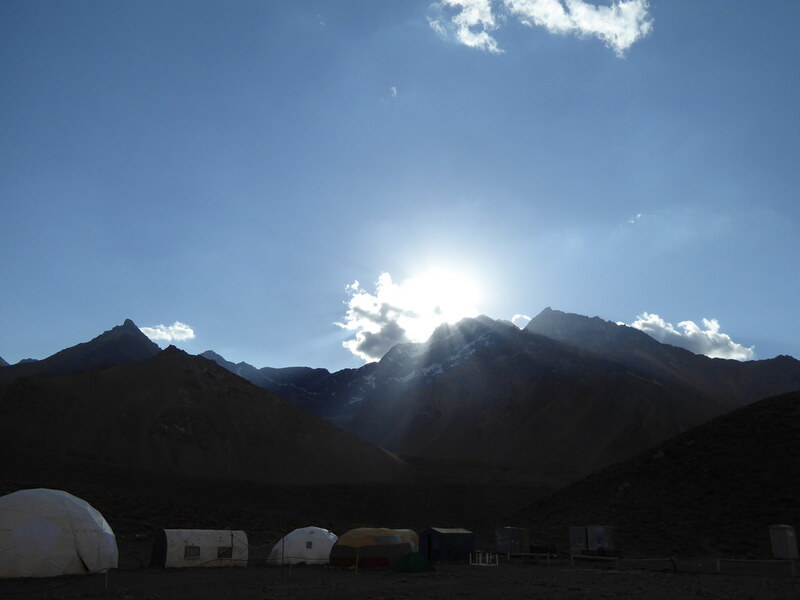 As might be indicated by the name of the camp, it is at the junction of two valleys. 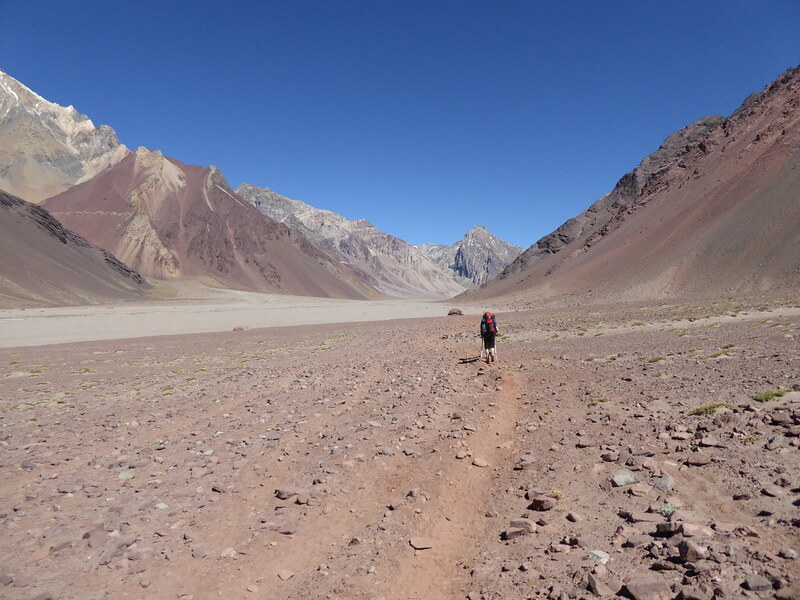 One is the main valley (and our route) called the Horcones Valley. 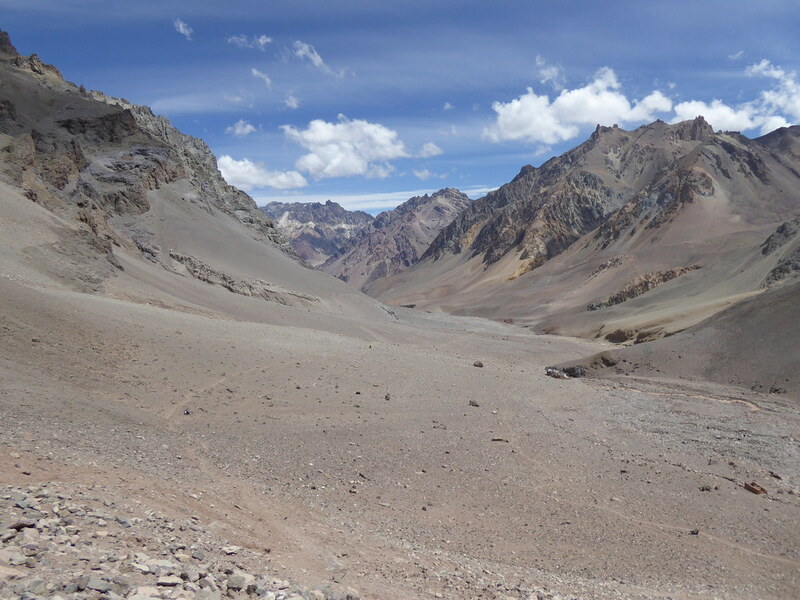 The other valley leads up to a camp at Plaza Francia from where the south side of the mountain is accessed. At the camp there are the many static tents provided by the various outfitters plus an area for camping for those who bring their own equipment in. 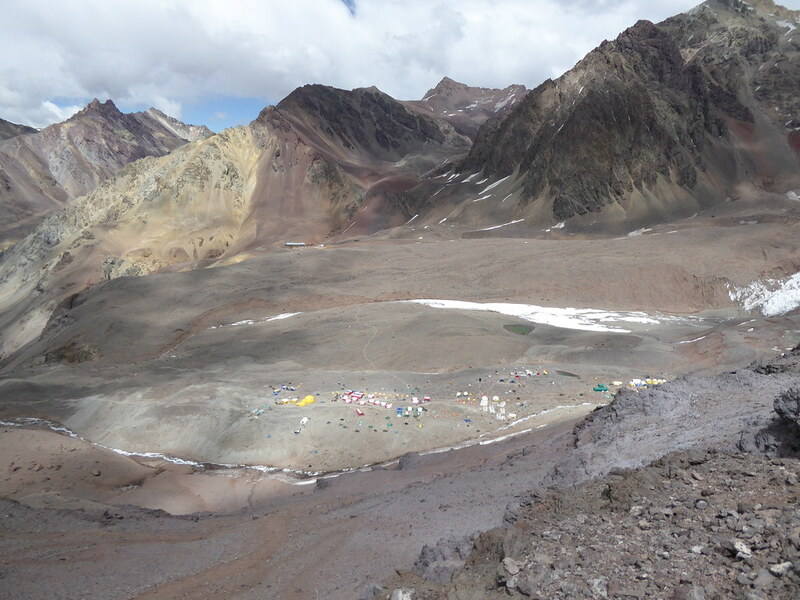 We were using Grajales so we had the use of their tents and catering (and chemical toilets!). We were well looked after by Victoria. We also had to undergo the mandatory medical check with blood pressure, pulse and oximeter checks from a doctor stationed at the camp. The results were duly noted on the climbing permit. All was well with the three of us. I was up early the following day. 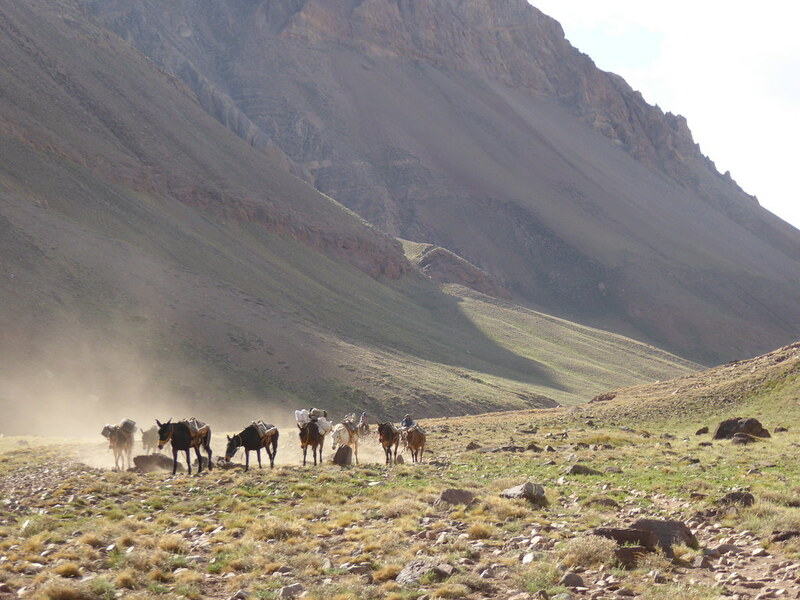 A mule train came by the camp heading up the valley. I did not spot our kit on the backs of any of the beasts. Breakfast was had and we were off promptly. I knew somehow that I was not going to go well that day. I kept up with Derek and Edu for the first couple of hours then lagged behind. The wind that was behind us for the first 20 minutes perversely switched direction and blew stiffly into our faces for the rest of the day. My Buff prevented my throat and lungs from becoming too irritated. 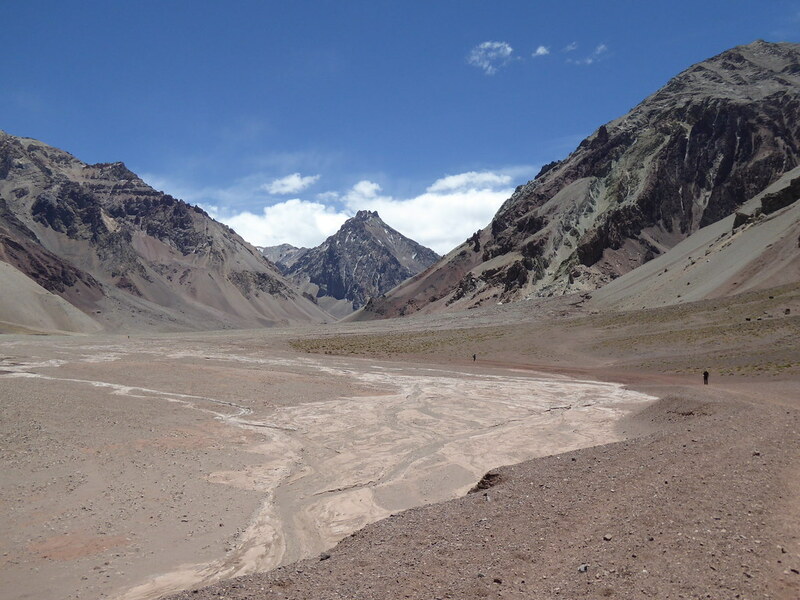 Whereas the valley up to Confluencia had some vegetation, beyond there was none even by the river. And then the valley went on.. 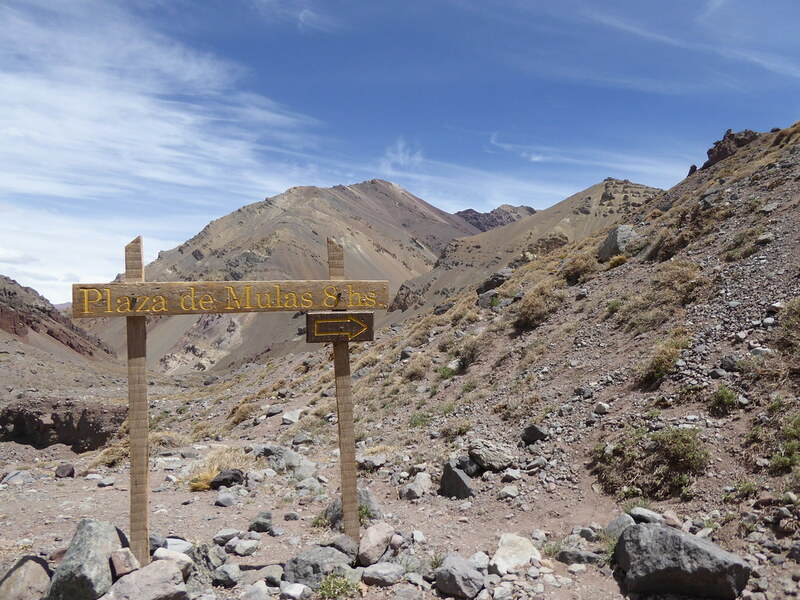 The valley ascended only gradually though there would be a 1,000m height gain to Plaza de Mulas. It was broad and dry. Dust kicked up off your boots. 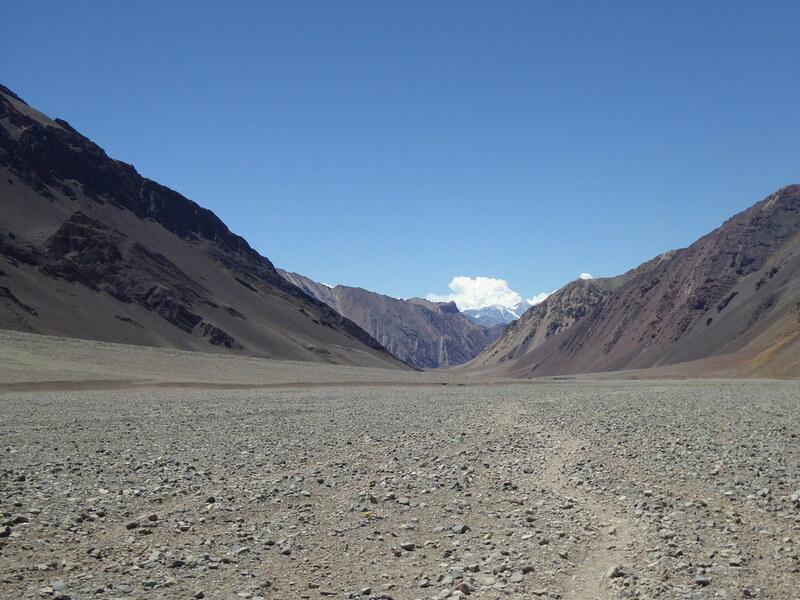 We crossed the river a couple of times and, as the valley switched direction on numerous occasions, we could only see perhaps a couple of kilometres ahead at any one time. We stopped for an extended period around the half way mark, though even before then I was stopping for breaks to keep hydration levels up. Setting off again I soon dropped back, now dodging some mule trains that were returning from their trip to Plaza de Mulas. The mules take no prisoners, so it is wise to give them a wide berth. Derek decided breaking the speed record between the two camps was in order and he disappeared into the distance. Edu stayed with me, or at least within sight, as I became slower and slower. The final killer was the 300m climb up steep loose ground before the camp. I ground my way up this with plenty of stops feeling a little sorry for myself and alone, though I could see a few parties behind me way below in the distance. Some undulating ground then leads to a helipad and 100m beyond that the ranger station where one is to check in and undergo the further medical check. I was amazed to see that, despite my travails, I had made Plaza de Mulas in 6¾ hours. The Grajales’ tents were another 100m on and our bags were on the ground by them. Here we would use our own tents for sleeping and we were allocated a dining tent which we shared with some Austrians. Here I sat for a good 40 minutes recovering. We were provided with squash and savoury snacks to help with hydration. 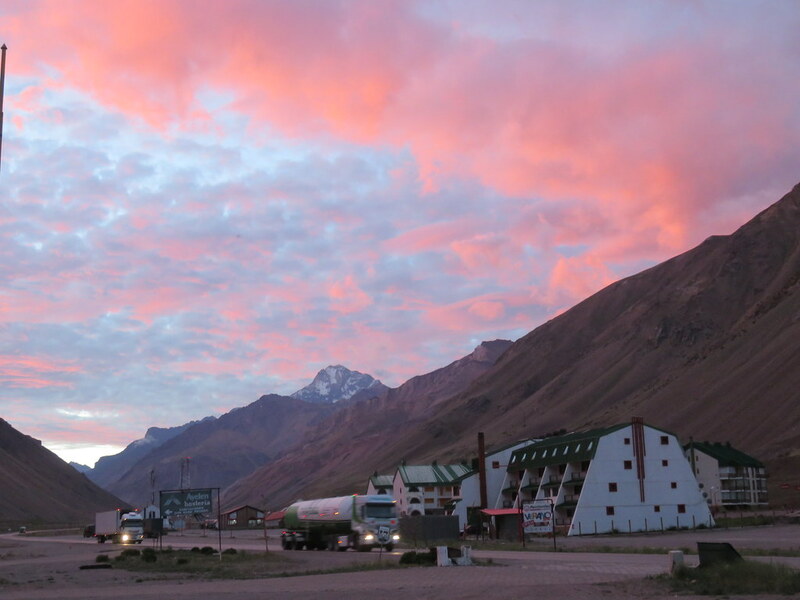 Various services are offered here from hot showers to internet access to porterage services (for carrying your gear up to higher camps) to a helicopter ride back to the Park entrance. We briefly considered porterage but decided that $300 for 20kg of kit was a bit much. Out of interest we asked what the cost of the helicopter was. Answer $1,500 for three. So we would not be using that either! I then went to help pitch our tent which Derek had already started. We had our meal, which was perfectly acceptable considering the location and then attempted to undergo the medical check. However, we were refused because the rather officious lady doctor wanted us to stay the night before doing this. 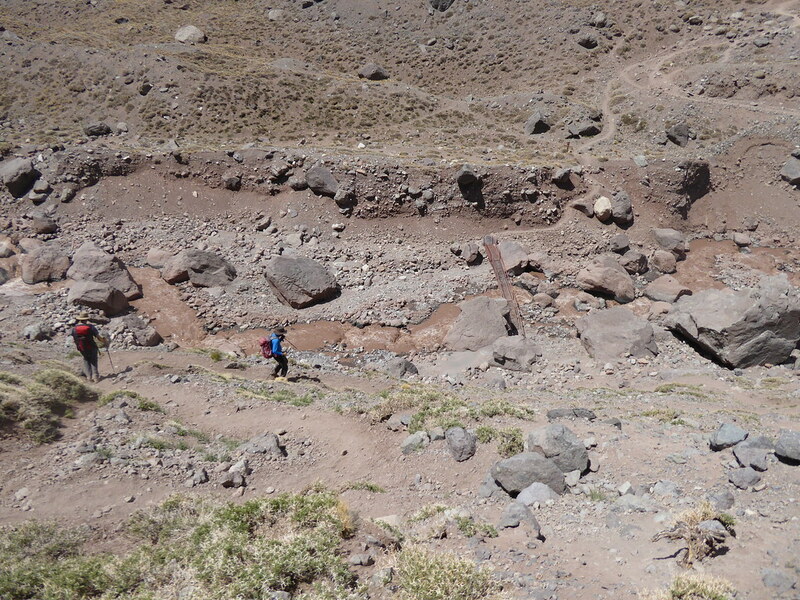 That was the case despite the fact that we remained well acclimatised following the Ojos del Salado ascent. Oh well, that would delay the start in the morning. After breakfast the next day we did our packing. The packs were big! I got off a bit lightly as my pack had the smallest capacity at 75l. Even this capacity was not big enough. We all had bits and pieces hanging off the outside of our packs. 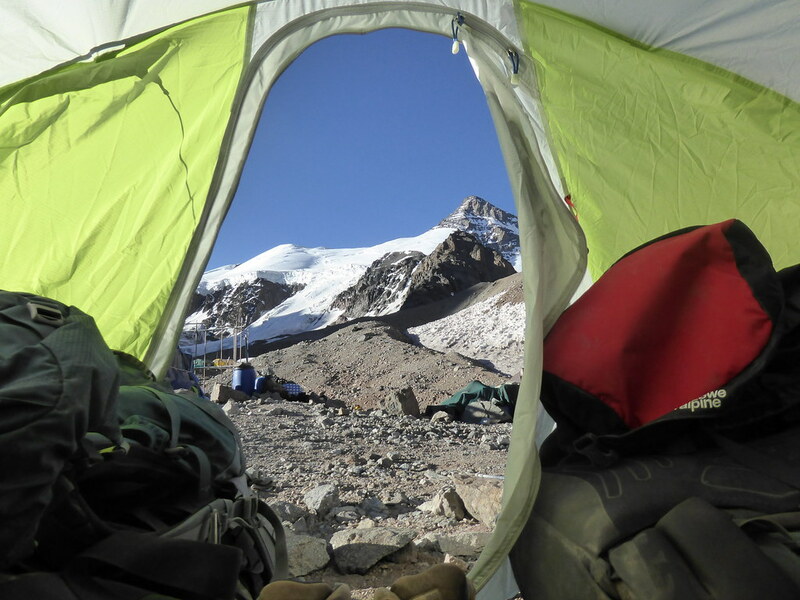 The plan was to spend the day by-passing camp 1 (camp Canada at 4,910m) and making our way up to camp 2 (Nido de Condores at 5,380m). 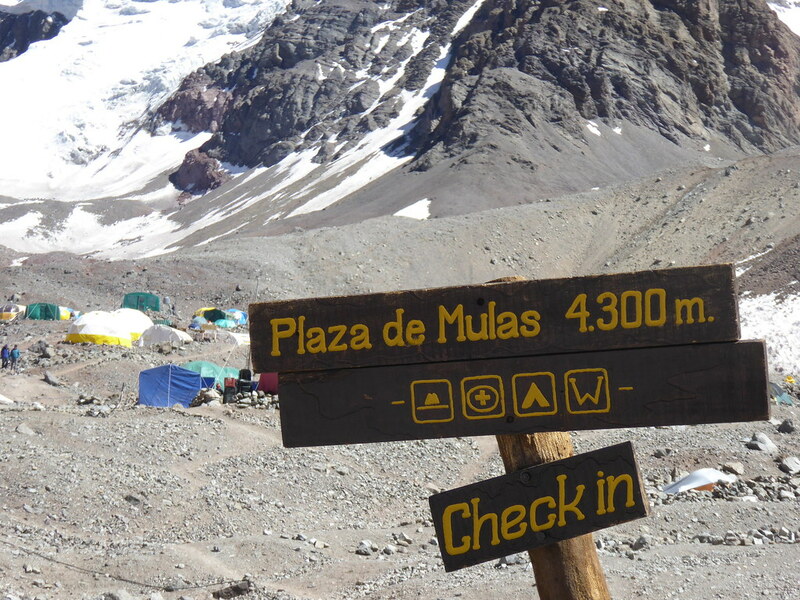 Plaza de Mulas is at 4,300m. We would then have a rest day before attempting the summit. Or that was the plan anyway. The weather forecast was not good. 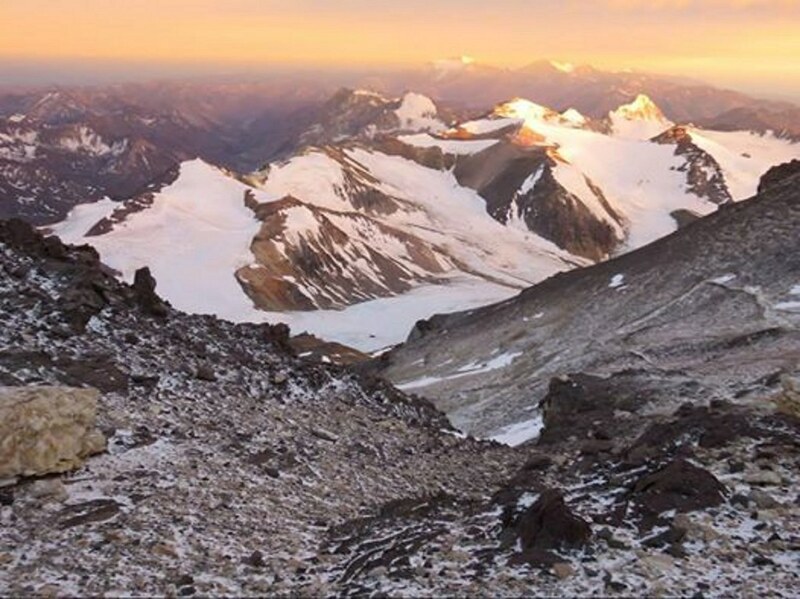 Sticking to that plan was the only chance of reaching the summit on the planned day because the forecast for the days before and after were all showing high winds at altitude. So although we had left a couple of spare summit days in our programme, these would not be usable as the weather would be deteriorating. So before setting off we went down to have the medical check. There I had a bit of a shock. Oximeter reading was fine. Pulse was a little high, but it had been whenever I had had these checks on this trip, but my blood pressure had hit the roof at 160/90. I was told that I could continue but that it was at my risk! This was not news I had wanted to hear. We set off. 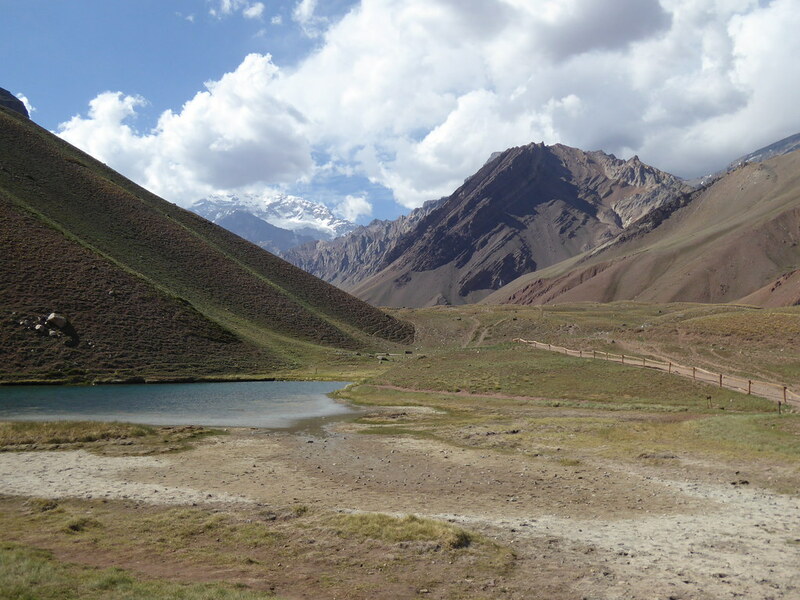 At this altitude one gains around 200m vertical per hour. After 4 hours we reached camp Canada and I and, surprisingly, Derek had had enough. We reviewed things and it was agreed we would stop there for the night although it was only early afternoon. Camp Canada is a cold camp, sitting on the top of a spur with no shelter from the wind. Our tents were soon up and we spent the rest of the afternoon resting and keeping warm in our sleeping bags. So the next day we would go to the Nest of the Condors a day late and so miss our rest day. And this we did. We did not have to start early as the vertical ascent was “only” 400m. We were back into unstable scree under foot. Whilst on the climb to camp Canada I was tired but not overly slow. On the climb to Nido de Condores I was both tired and slow, requiring plenty of stops. Eventually the other two gave up on me! It took me over 4 hours to do this section and I knew I was not going to go any further now. I was resigned to this and I also developed a headache that I could not get rid of. This I did not understand given that I had been to 5,380m (or near enough) on six previous occasions on the trip. 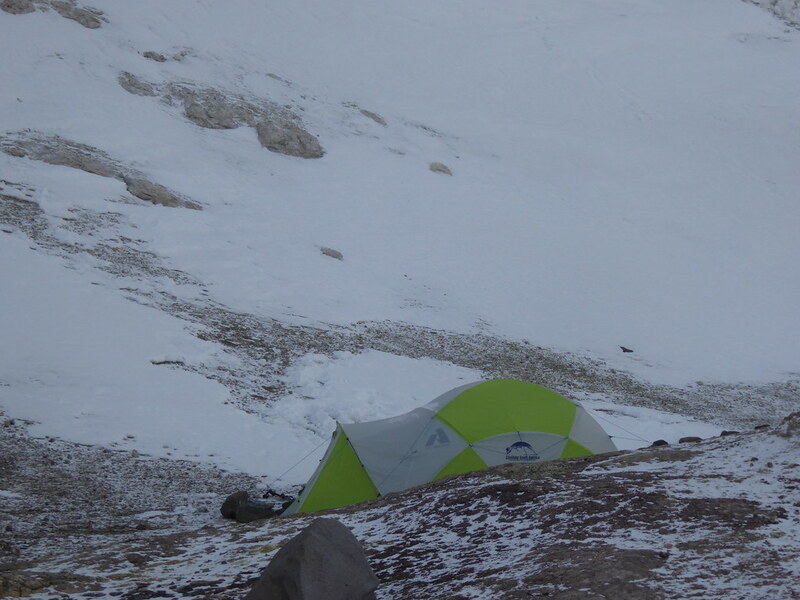 At this camp it is possible to find a pitch that provides some shelter from the wind. We had cached gear at camp Canada, including the single person tent. So we would be sharing the three person tent. Edu and Derek put the tent up as I placed a few rocks over guys and the skirt of the tent to keep it secure. 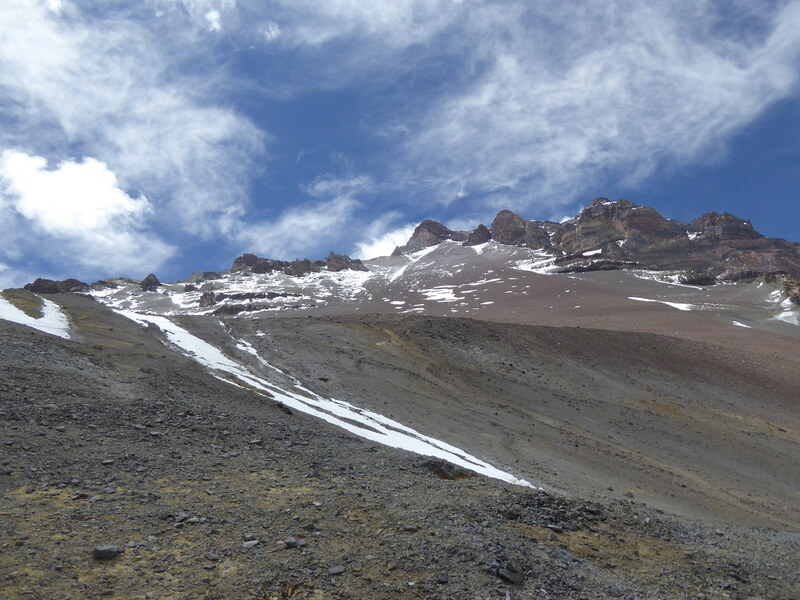 Edu then went up a nearby slope where a spade had been conveniently left in order to collect snow for melting. The views were stunning, but it was too cold to stay outside for long to admire them. We huddled in the tent whilst Edu melted the snow for tea. Then we were hit by a short sharp snow storm that deposited 2 or 3 cm of snow. Edu cooked a pasta meal but none of us felt up to eating much when it was placed in front of us. I took some painkillers for the head, but they had little effect. I drank and had a few snacks – oh and coughed. But all the energy had gone from me. I told the other two that I would not be making any summit attempt the following day. I would stay in the tent and await events. The Austrians who had shared our dinner tent 1,000m below were also there. 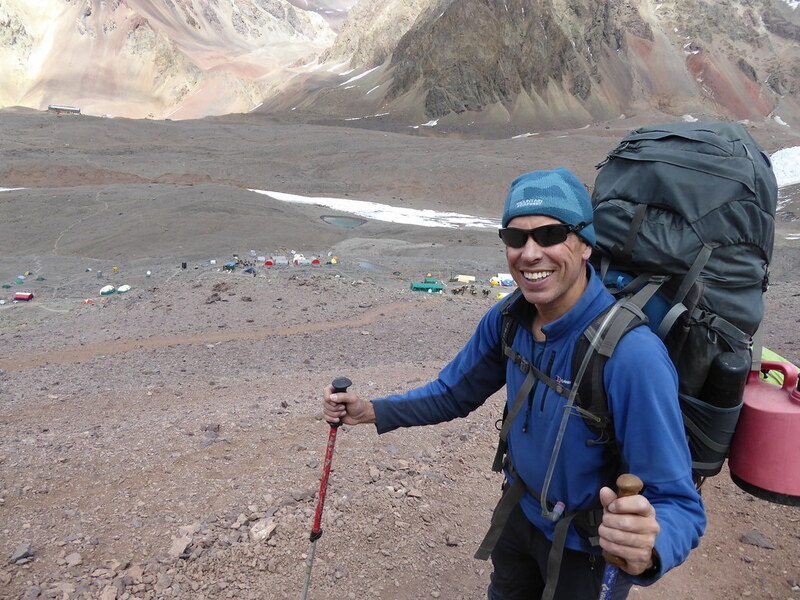 It was agreed that they together with Derek and Edu would start out around 5am, aiming to get to the summit around midday. 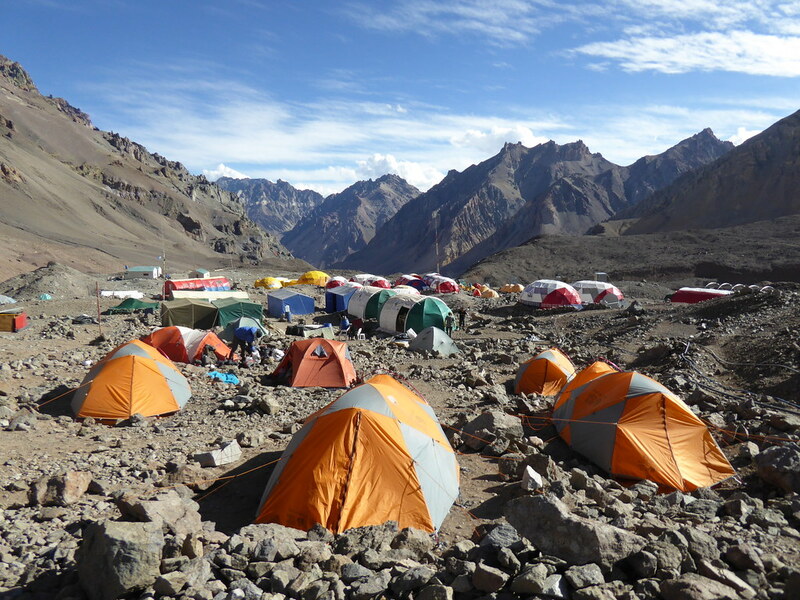 Activity started around the tents about 3.30am as more water was boiled, food eaten and last minute preparations made. Ironically, in our tent, I was the one who had probably slept best although it had been broken sleep punctuated by coughing fits and the need to clamber over Derek in order to go to the toilet. All of that drinking!! It was remarkably calm during the night but the wind started gusting as people were preparing to go. This dislodged the tiny ice crystals that had formed on the tent inner from the condensation from our breathing. They came floating down covering sleeping bags and were surprisingly refreshing on the face. Eventually the Austrians left just before 5am followed shortly after then by Derek and Edu. I was unable to get back to sleep. I rested though and drank more. I nibbled at some snacks. I was probably the highest person in the world doing (or attempting to do) Times crosswords. Derek had decided it was a good idea to bring a book of them up to this camp. Still it stopped boredom kicking in! At 10am Derek and Edu returned with one of the Austrians and their guide. I had heard a couple of the Austrians returning before then. 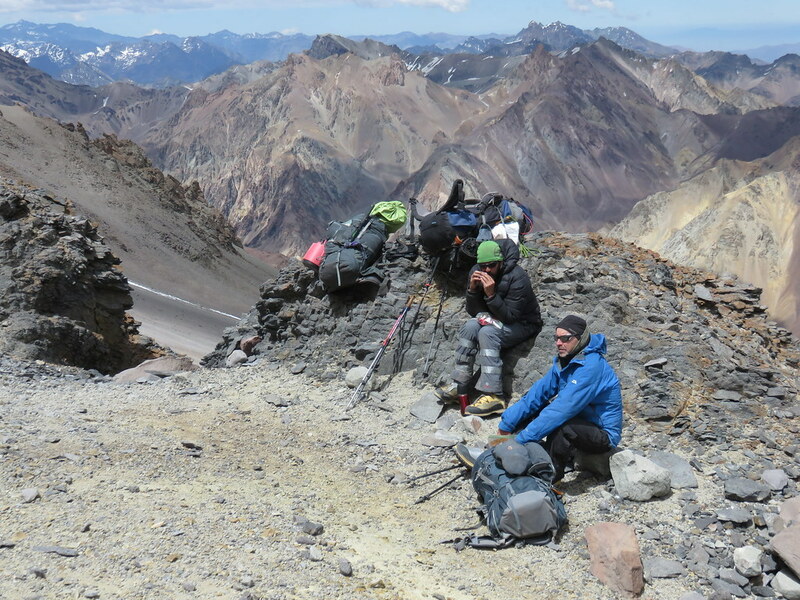 Derek and Edu had made it beyond camp Colera at 5,870m and almost to Independencia at 6,300m. But the wind had simply been too strong to go any further. No-one was going to climb that mountain that day. Derek looked as I felt, collapsed into his sleeping back and was unresponsive for about an hour as he recovered. So we had a choice – stay up at Nido de Condores to see what might transpire or to descend immediately. I left that decision to Derek. At the end of that hour he sprang up and said that we should descend. So there was a flurry of packing and around noon we were off. It is amazing how much easier it is to descend. 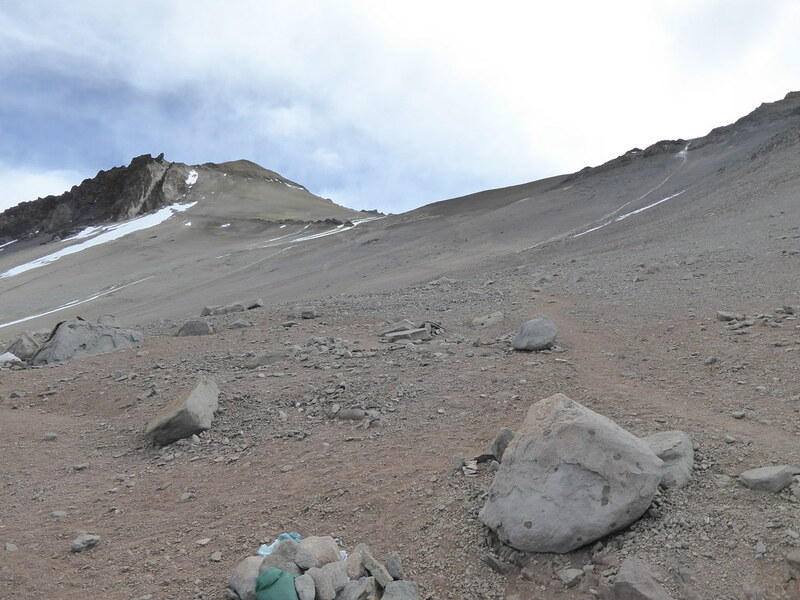 A climb that had taken 7½ hours over two days took two hours on the way down. We were back at Plaza de Mulas at 2pm. We were again looked after by the Grajalas team and made arrangements to leave the following day. 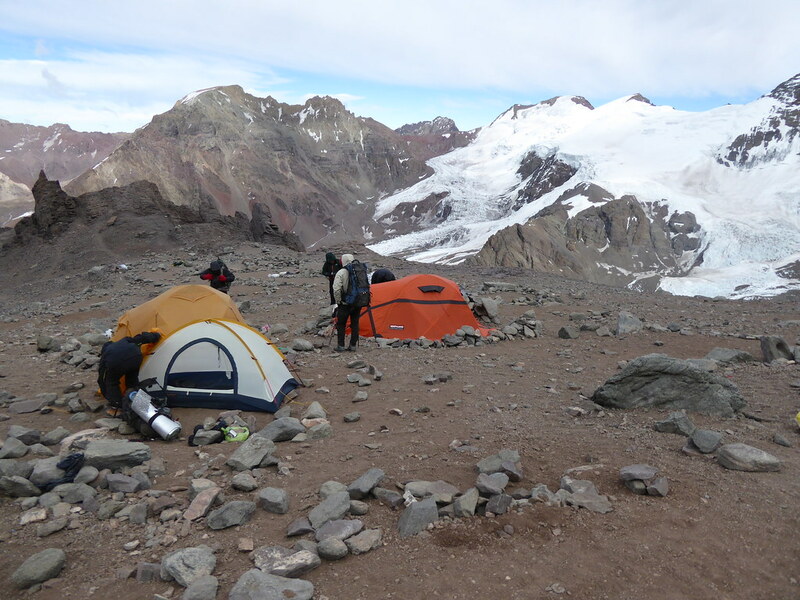 No-one climbed Aconcagua for at least 9 days after then because of high winds. Our return to the Park entrance took just over 5 hours. The wind was behind us, perhaps in more than one sense, for all but the final half hour. The mules with our kit sped by. I was tired at the end of the day, but it was a “happier” tiredness. Enrique was not there as hoped for, but the Grajales team gave us a lift to the Park office to check out and for me to surrender my permit and then to take us to our hotel. A shower later and I had rediscovered my appetite as a large dinner was wolfed down. Well that was the end of the mountaineering. Now it was time for some R&R in Santiago and to await Julie’s arrival in a couple of days.